Pineapple Carrot Buttermilk Muffins: I don’t remember the last time I was this excited to share a muffin recipe or any recipe for that matter because I’ve made the best muffins in the entire world and it’s eggless too! It might look like a tall claim but I think I have finally cracked a recipe for the best muffin base. 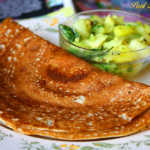 One can use this base recipe to create countless variations. When I pause a bit now and recollect again, I think I was this happy when I first found the combination for the best egg substitute for cakes while baking this strawberry cream cake and when I first made the most light and flaky eggless blueberry scones by following a specific procedure. So this carrot pineapple muffin recipe also comes under the category of “the best way to bake” certain things. The original recipe is for buttermilk muffins from the book The Best of Better Baking.com. This is the best $1 I have spent because I got this book from the library on a Friends of Library sale. It has a lot of bread recipes and I was not in the mood for baking with yeast and feel lucky that I saw this muffin recipe. I had some fresh pineapple slices and decided to pair it with grated carrots to make the classic carrot pineapple muffins with walnuts. I also had half a zucchini so mixed in that too. The recipe called for 1 egg. I usually prefer using vinegar for muffin recipes especially for muffins with fruit because they will be dense to begin with, so adding vinegar will give a less heavy texture to the muffins. 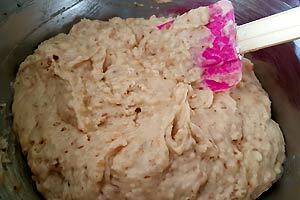 The original recipe being for a buttermilk muffin, buttermilk and vinegar both being acidic will affect the texture of the muffins too much so the next best choice was to use flax egg and increase the quantity of baking soda. Until now I thought that the vegan blueberry muffins were the best muffins I have ever baked. It is still one of the best but this carrot pineapple muffin recipe precedes that because that recipe was from another book. I didn’t make any changes to make it egg free. Whereas this eggless buttermilk muffin recipe is my variation of the recipe to make it eggless and it has turned out absolutely great! How To Make Pineapple Carrot Buttermilk Muffins? 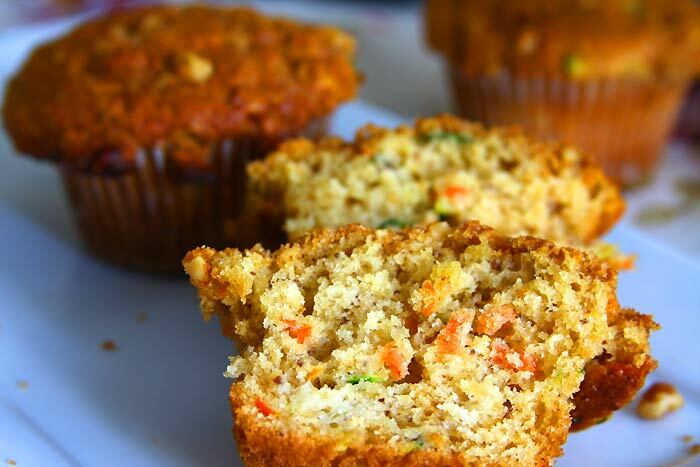 Here are the step-by-step pictures for making these mouth-watering muffins. 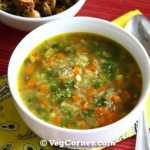 Scroll down for the actual recipe. 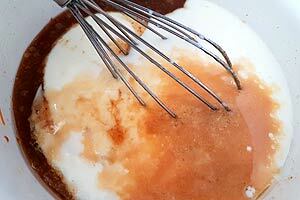 Pour wet mix into dry mix. Stir in fruits and veggies. Carrot pineapple muffin batter is ready! Fill muffin cups with batter. The method of baking the muffins at a higher temperature at first for few minutes and then lowering down the temperature was also new to me. 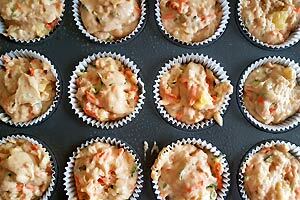 So I was eagerly waiting to see how these egg free carrot pineapple muffins bake. Surprise! It rose beautifully, just like the ones you would buy in a bakery. The texture was light and airy just like any other muffin with eggs and the taste was perfect! I can’t think of another way to bake muffins hereafter. 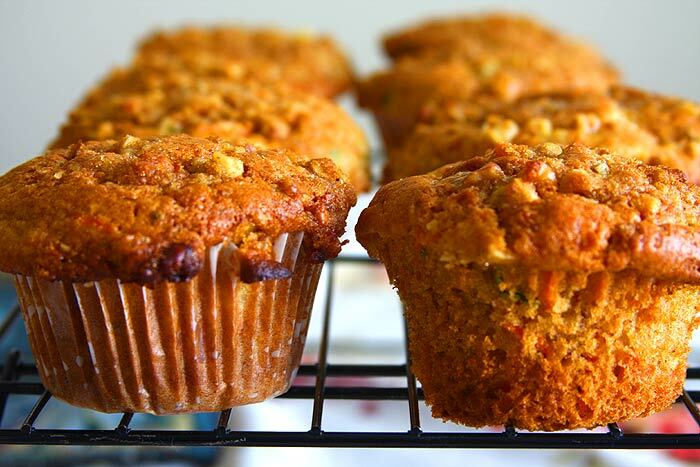 I know I will be baking these eggless pineapple carrot muffins again and again and also variations of this recipe with different fruits and nuts. If you want to bake the best muffins ever, try these buttermilk carrot pineapple muffins and I assure you will be floored by the taste and texture of these bakery style muffins. Use seasonal fruits to bake different variations of these buttermilk muffins. 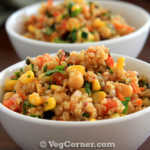 In a small bowl, mix together all the ingredients listed for the streusel topping to make a crumbly mixture; set aside. Preheat the oven to 400F/190C for 15 minutes. 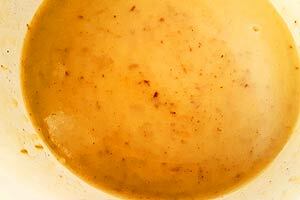 Make flax egg in a small bowl and set aside. Line 12 muffin cup pan with paper liners and lightly grease it with non-stick cooking spray so that peeling the muffins off the liner will be easy. Also grease the top of the muffin pan because when the muffin top rises fully it will stick to the pan otherwise. 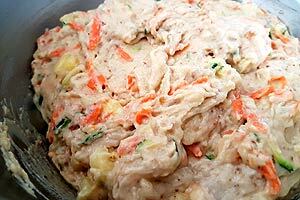 In a large bowl whisk together the ingredients listed under the wet mix. 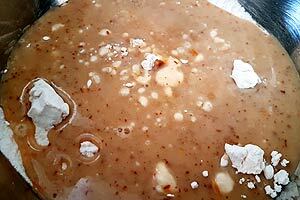 In another large bowl, stir together the flour, salt, baking powder, baking soda and cinnamon. 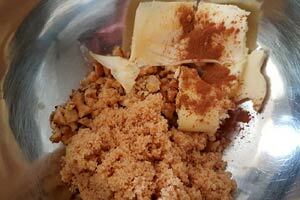 Add to the wet ingredients and mix well. 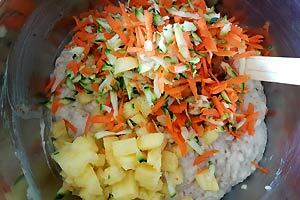 Fold in the carrot, pineapple and zucchini. The batter will firm up. 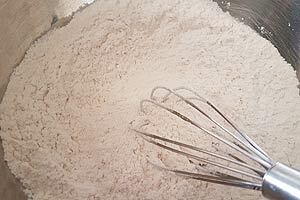 If the batter seems to be loose, add up to 1/4 cup of flour in small increments to make the batter a bit stiffer. Use the 1/3rd cup measure to scoop the batter and fill the muffin cups to the top. 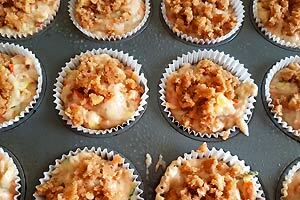 Sprinkle the streusel topping evenly over each muffin. Bake the muffin for 15 minutes at 400F and then lower the oven temperature to 350F and bake for another 12-15 minutes, or until a toothpick inserted in the middle comes out clean. Mine was done in 14 minutes. Remove the muffin tin from the oven. Let the muffins cool in the pan for about 10 minutes before you can unmold it and cool it on a wire rack. Trust me when I say that these are the best muffins I have ever baked in the past 10 years. I was super proud of this no egg carrot pineapple muffins because the original recipe had egg and I made it egg free. I can’t say enough about how light and airy the texture was especially for an eggless muffin. The sweetness was just right for us, but if you want it a bit sweeter you can increase the quantity of sugar. The streusel topping made these muffins taste even better. The crunchy topping was to die for! Do not omit the topping. 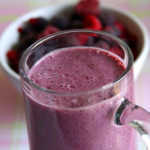 Can increase the sugar to 1 and 1/2 cups if you like it a bit sweet. I added zucchini because I had a small piece leftover. 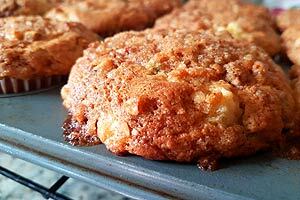 There are so many other variations you can bake keeping this as a base recipe. Like, cranberries, apple, banana, blueberries, strawberries, etc. 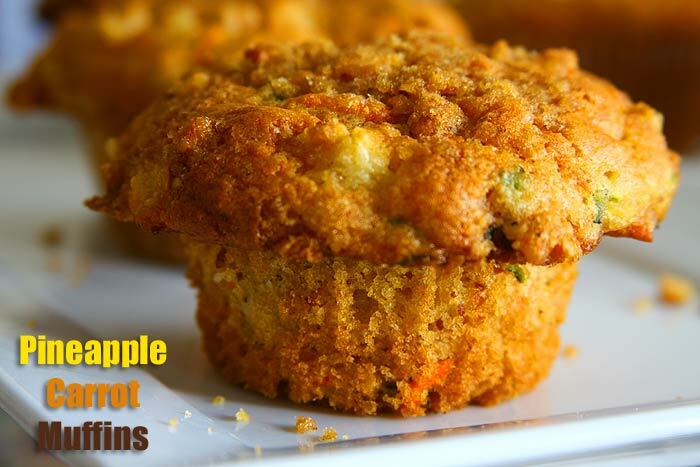 Substitute some of the all-purpose flour with whole wheat flour to make healthy pineapple carrot muffins. What is a flax egg? Can I use a regular chicken egg? 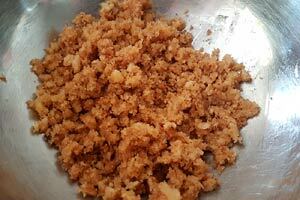 Flax egg is a mixture of flaxseed meal and water which is a vegan substitution for egg. Yes, you may use chicken egg too. You’re very welcome, Maryann. Thank you very much for your kind feedback. It’s great to know that the vegan version works too.